At first glance, Mickey Hart's Mystery Box appears to be a bit of a departure from the Grateful Dead percussionists Mickey Hart's last few albums, all of which have focused around drum and rhythm tracks performed by an all-star line-up of artists from around the world. In reality, however, this is just a logical extension of Mickey Hart's past musical excursions. Overlaying the rhythmic sounds created by Hart, Giovanni Hidalgo, Zakir Hussain, Sikuru Adepoju, Babatunde Olatunji, and Airto Moreira are the sweet, soulful vocals of the Mint Juleps. What ensues is an album with more of a rhythm and blues feel than many Hart fans may be accustomed, but much like Robbie Robertson's excellent, self-titled release from 1987, persistence will pay off with tremendous rewards. 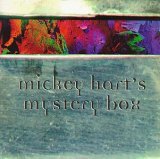 Robert Hunter penned the lyrics to all of the songs on Mickey Hart's Mystery Box, and as with all of his poetic creations, the lyrics contain multiple meanings that will shift depending upon one' s mood. Lines that didn't make sense will suddenly become clear. Those that were clear will suddenly become vague. Still, it's hard not to look at many of these as being related to the loss of Jerry Garcia, and a great deal of comfort can be found within the words as well as the music. The Mint Juleps handle the Hunter-penned lyrics so skillfully that the ensemble essentially becomes a rhythm track of its own. This is most effective on the pounding, driving Full Steam Ahead, the dream-filled The Next Step, and the upbeat Look Away. Hart adds his own vocals to the most accessible track on the disc Down the Road, which also includes accordion and backing vocals from Bruce Hornsby. Hart also sings the eerie Only the Strange Remain, and a portion of The Sandman, which includes some funky rhythm guitar work from Bob Weir. In short, Mickey Hart's Mystery Box is a multi-dimensional album that contains many subtle rhythm and vocal textures. Mickey Hart's Mystery Box is available from Barnes & Noble.